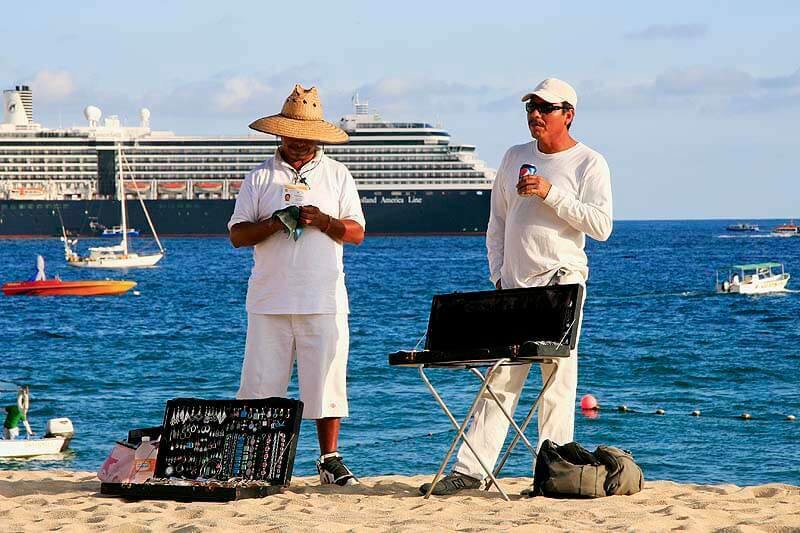 The cries of the beach vendors are as characteristic of Cabo San Lucas as the sun, sand and sea. Day in and day out, you see the same good-natured men and women, dressed in white pants and shirts, traipsing along the sand, loaded down with their wares. And bargaining in Mexico is the name of the game if you want to buy and take a souvenir home. You may not be comfortable. But it’s worth learning how to bargain. Just as haggling in Mexico is common, bartering is a way of life in other places around the world where you might also travel – like Thailand, Myanmar and elsewhere in Asia. Cabo isn’t the only Mexican resort destination where shopping (and bargaining) is done on the beach. Puerto Vallarta is another. Add Cancun and Riviera Maya to the list too. But not in Ixtapa – the state of Guerrero has banned vendors from the beaches there (vendors can only sell in tourist markets). Pssst! Check out the totally awesome things to do in Riviera Maya! 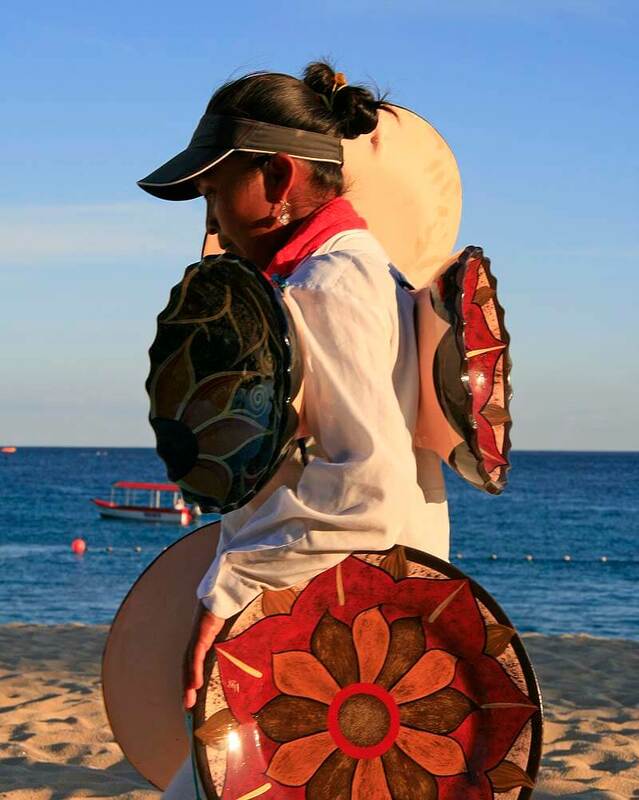 In Cabo San Lucas, most of the vendors ply Medano Beach. 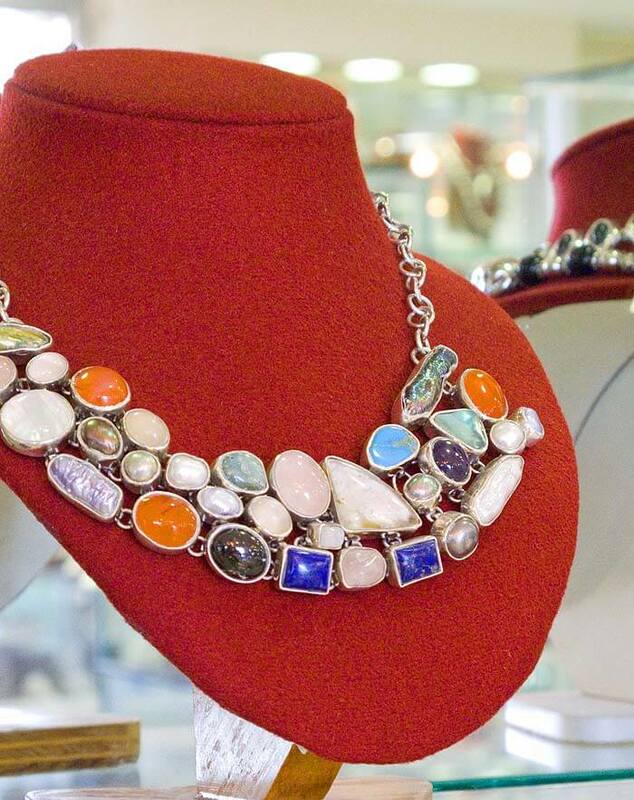 There’s lots of shopping in Cabo San Lucas on the beach… Silver jewelry. Sun dresses, T-shirts, and sunglasses. Sombreros and cowboy hats. 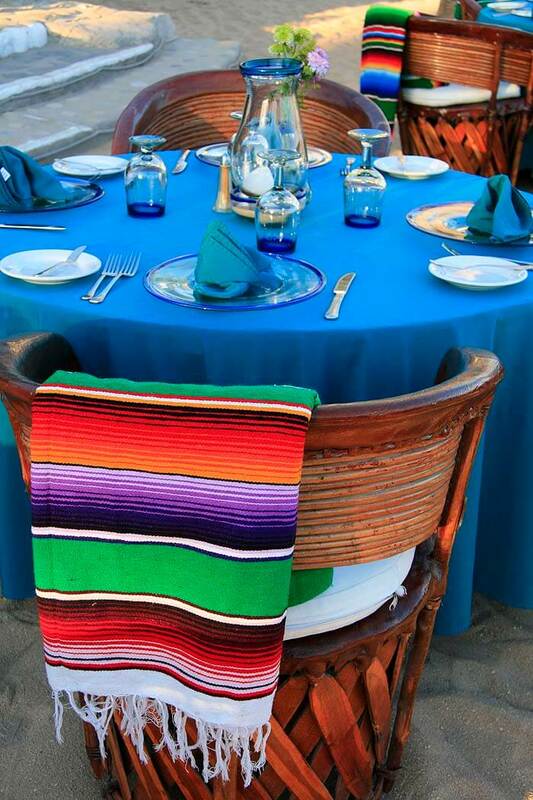 Colorful Mexican blankets. Temporary tattoos and hair braiding services. 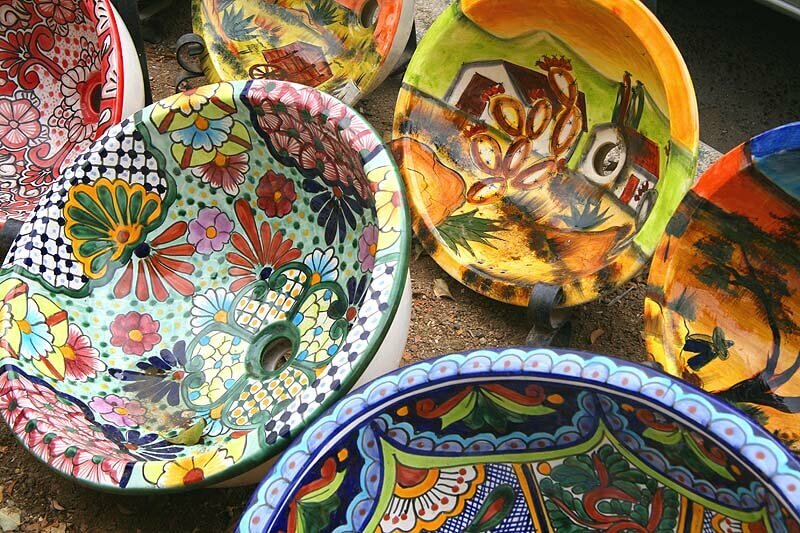 Decorative ceramic plates. Polished wood carvings of marlin and even bears. You name it, they sell it! At Los Muertos Beach – Puerto Vallarta’s busiest and most popular stretch of sand – vendors also sell food, like barbecued shrimp-on-a-stick and donuts. If you’re not interested in what the Mexican beach vendors offer, simply say “No thank-you” or shake your head, and they’ll move on. Tip: In Cabo, many resorts and bars on Medano Beach have roped-off areas for guests, where passing vendors can’t cross. Pick a spot behind the rope if you don’t want to be bothered. The vendors in Cancun are pretty low-pressure. 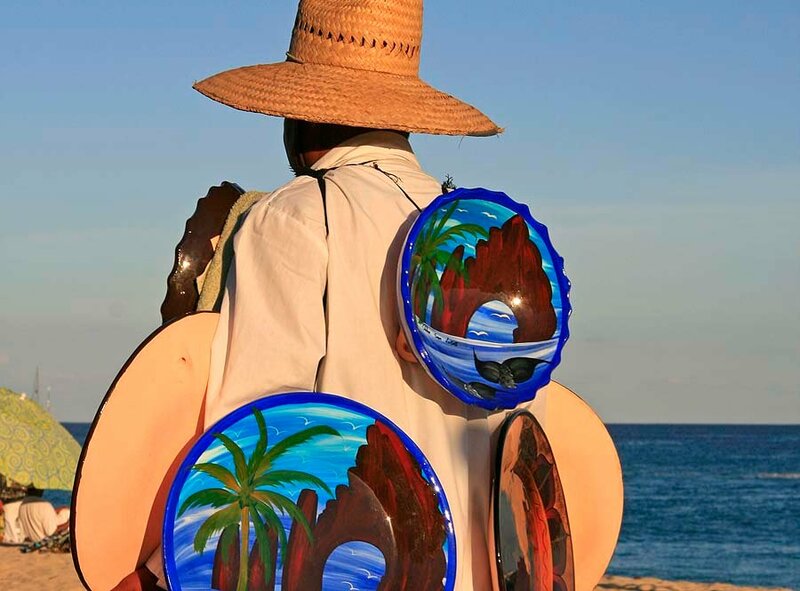 But if you’re keen and want to take a closer look, the vendor who’s caught your eye will spread their goods out on a blanket on the sand, or display their silver jewelry in an open suitcase propped up on a little stand. Then the bargaining begins. Remember, the vendor is happy to bargain with you. They want you to engage with them, and the bargaining should be fun. You could start with offering half of the asking price. But the vendor might act offended; for sure, they will say no and come back at you with something higher than your offer, but lower than their first ask. One of the best bargaining tips? Start to walk away. You’ll find out pretty quickly how low the vendor will go. Expect in the end to pay about 30% less than the top asking price. If you’re tough, you might even get away with a 50% discount. But it’s not all about squeezing the last peso out of the vendor, right? In this delightful story on “How to Bag a Bargain in Mexico,” travel writer Marie Javins was even prepared to pay full price for a hand-embroidered Otomi textile in the colonial town of San Miguel de Allende – but was bargained down by the grandpa who had sewn it. 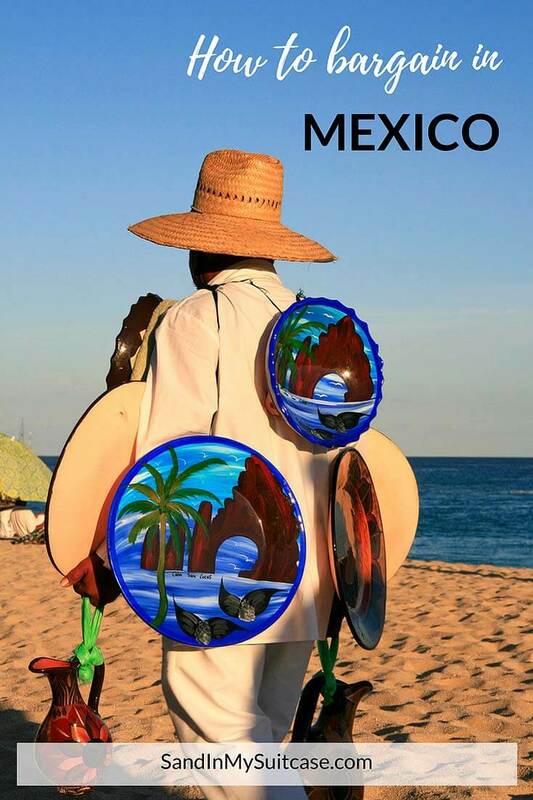 Tourism is what makes Mexico’s resort destinations tick, and bartering in Mexico and selling wares is how vendors make their living. The current exchange rate is about 19 pesos for one U.S. dollar or 14 pesos for one Canadian dollar. (Check the rate at the time you go.) Vendors take U.S. dollars. But you’re usually better off to pay in pesos. If you’re happy with the price, it’s a good deal. And you’ll take home a nice little memory of your Mexico vacation. Find more Cabo tips here! 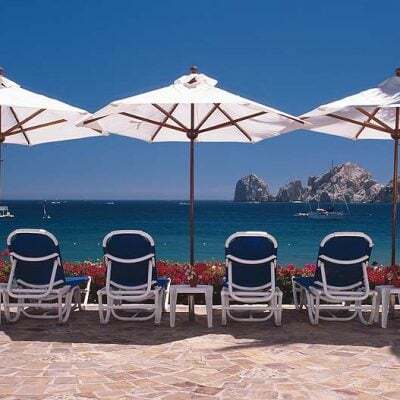 See our indepth Los Cabos travel guide! Oh, the stuff we’ve bought! Yes, George has bought bears, even though we don’t believe Mexico is home to bears. George couldn’t resist, since black bears often wandered down from the mountains and roamed around our old Vancouver neighborhood. Buying silver in Mexico is a bit tricky on the beach – but we’ve bought lots of it! Only one bracelet has ever broken; unfortunately that was a gift to Janice’s best friend, so we promptly had to buy her friend another on our subsequent trip to Cabo. We’re walking advertisements in the gym with our “Cabo!” T-shirts. One fell apart in the washing machine, but we still use three others as throws in the house (good for snuggling in when watching TV). We had to lighten the load of one of the vendors pictured here :-). Great for covering up, they also double as tablecloths when we go on picnics. Find this helpful? Then pin it! We recently returned from another visit to Los Cabos (it’s our “go to” place for a little winter warmth). Of course, we couldn’t resist buying yet again another piece of silver on the beach. And we updated this post :-). Do you like bargaining in Mexico? What have you bought? This is a good post. This is something a lot of tourists don’t know how to do because it is not a thing in the United States, however it is normal in a lot of Spanish speaking countries. 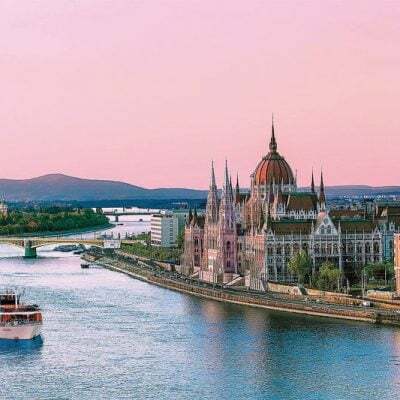 The unfortunate thing is that if a native sees that you are a tourist, there is a big chance that you are going to get a high asking price for what you are trying to buy. You’re right, Alyssa, most tourists are going to pay more than locals. 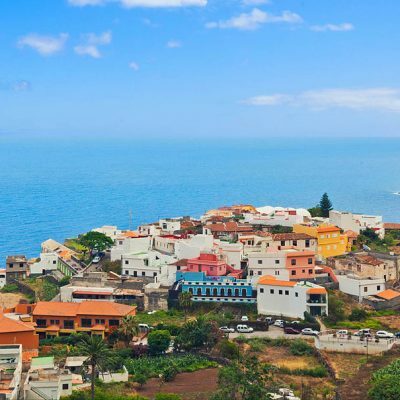 It helps that tourists are usually okay with this; they earn more than locals and have more spending money – and they’re still paying less than what it would cost to buy the item back home in the U.S. or Canada :-). Thanks for chiming in! This is so helpful! I haven’t been to any of these destinations yet but they’re on my list. I love the items in your photos too so I’ll definitely need the bargaining info. Thank you for the helpful tips. I also love the way this shares a way of life and keeps it alive. I really enjoy reading this article. Unfortunately I’ve never been so good at bargaining although I live on the Balkans – in Bulgaria, to be more precise. But I enjoy watching my friends doing it. You have to be clever and to think faster than the trader. It’s funny. Thanks for sharing what it’s like in the Balkans! Bargaining is a bit strange for us Canadians too, because we’re not used to it. Shopping is all “fixed price” — unless you go to a garage sale at someone’s house :-). These are some excellent tips on bargaining on the beach everywhere in the world, not only in Mexico. Very enlightening and informative post, Janice and George! Love this! I used to go to Mexico with my family as a child, and my parents always told me to bargain at the markets! It’s quite fun too, once you get used to the idea. The only problem is when you return home and ask a store if they can offer a discount or a better price, they look at you strangely. I think over the past 12 months the closest thing to bargaining we’ve done is over the price of a cab ride in Laos that still cost way more than it should have done for a local. We don’t really buy much whilst we’re on the go as we like to count our photographs and memories as souvenirs, but should we see something when we (hopefully) see Mexico next year, we’ll be clued in a lot more to get a fair price for what we’re after. No doubt every traveler has overpaid for a cab ride at least once! Just take comfort in knowing that you helped support the local Laos economy :-). And when you get to Mexico, have a great time (the people really are very warm and friendly). Janice and George, I’m glad you found that they will leave you alone once you say “no” when you were in Cabo. Because in Ensenada they would not leave you alone after telling them “no”. It made for a horrible experience off of our dinner cruise. That’s too bad. 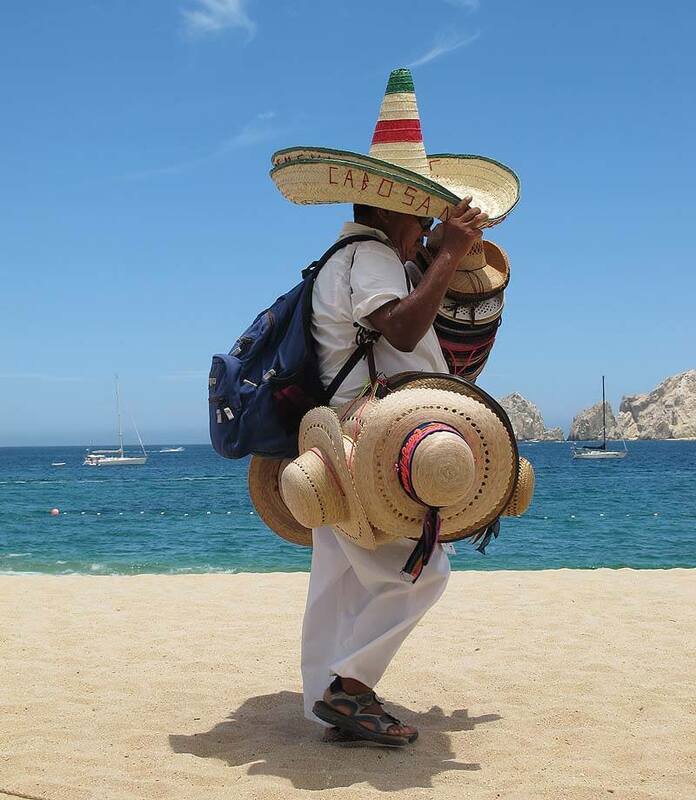 It isn’t fun when you feel “pestered.” Sometimes you have to say “no” a couple of times to some vendors in Cabo, but they do usually say, “Ok, amigo, maybe tomorrow” and leave you alone. 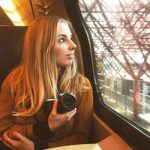 Great tips and wonderful pictures! I can’t resist a store that comes to you while you’re sipping a margarita on the beach! Pretty easy shopping, isn’t it? Even beats buying online! We bought the bears as well (and much, much more)! We love them – only thing was that when we came back to Canada customs held us back to inspect the wood items! Oh, that’s so funny – they must carve the bears for us Canadians! Hopefully you eventually got your bears back from customs :-).